By Julia Lee, Noozhawk Intern | @NoozhawkNews | May 27, 2017 | 11:55 p.m.
Santa Barbara is now home to Cat Therapy, a downtown café where customers can hang out with cats from local animal shelters. The café’s mission is to help shelters by fostering their felines and marketing them to raise adoption rates. 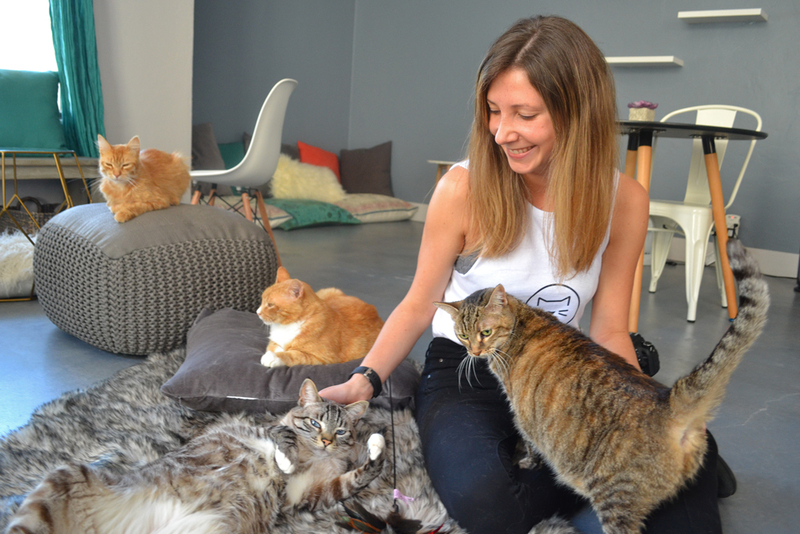 At Cat Therapy, people are able to observe the cats’ different personalities in a more relaxed environment than at a shelter, and have the opportunity to build a connection with any of the animals, owner Catalina Esteves explained. The café at 1213 State St., Suite L, opens officially Monday, and will be open 11 a.m. to 8 p.m. daily except for Tuesdays. Reservations are required, however. Esteves, a musician and a photographer, moved to the South Coast from Argentina about three and a half years ago. She volunteered at the ResQCats shelter for two years. “I realized that my favorite thing in the world was to hang out with animals and to feel like I could make a difference,” she told Noozhawk. Esteves then pursued her dream to open her own business and spent about six months planning for the opening and talking with animal shelters. Cat Therapy is partnering with the Animal Shelter Assistance Program, or ASAP, the Ventura County Animal Services Shelter and, to a lesser degree, ResQCats, which focuses more on kittens, according to Esteves. There currently are 11 cats in the café, half of them from ASAP and the rest from Ventura, Esteves said. The number of cats in the café will fluctuate between 10 and 15. The goal is to promote adult cats that often don’t get adopted as quickly, demonstrating that the adults are just as fun and playful as kittens. They are already trained as well and have their personalities established, she said. The café is also meant for people who love animals but are unable to have pets for reasons like rental agreements or because they’re attending college. Cat Therapy is also partnering with Brasil Arts Café, 1230 State St., to offer a selection of food and drinks that will be delivered during customers’ visits. The café recommends that reservations be made 24 hours in advance. Rates are $10 for 75-minute sessions during the week and $12 on Saturdays and Sundays. Visitors will get a short introduction about the house rules, and Esteves said the cats will be wearing different collars so people will know which ones are shyer and which ones are confident. Esteves noted that the cats’ behavior will vary throughout the day. During the morning they’re all-out excited, but they’re often napping in the afternoon. In the evening, they have lots of energy again. The café also is available to be rented out for study groups, birthday parties or other occasions. Although the place can accommodate up to 16 people, parties of seven or more are required to make their sessions a private event. Group pricing is $150 for 75-minute sessions during the week and $180 on weekends. Early buzz has already generated bookings for bachelorette and birthday parties, as well as a wedding reception. Click here for more information about Cat Therapy, or contact the café at 805.560.1996 or hello@cattherapysb.com. — Noozhawk intern Julia Lee can be reached at news@noozhawk.com .